"Distrust and fear all those who speak of pacts and compromises with the fascist invader, as enemies of the working class. We do not accept a pact or a compromise other than to fight without resting to crush Franco and his allies. 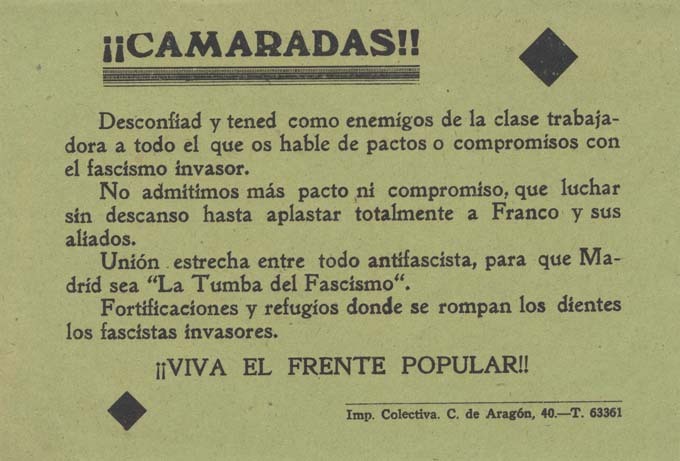 A closer union among all antifascists, so that Madrid can be 'The Tomb of Fascism.' Fortifications and refuges [are] were the teeth of the fascist invaders will be broken. Long live the Popular Front!"